Term Meristems was given by Nageli, it means juvenile/young tissues. Cells of these tissues have the ability to divide. These cells are thin-walled, living, having dense protoplasm, conspicuous nucleus, and are in an active state of metabolism. PROMERISTEM: Also referred as embryonic meristem. Present at the apices of the shoot and root tip. It divides to form primary meristem. PRIMARY MERISTEM: Found below the pro-meristem in the shoot and root tip & intercalary meristem. They divide to produce primary permanent tissue that forms the primary plant body. SECONDARY MERISTEM: It is formed later in the plant body. It develops from primary permanent tissue due to dedifferentiation. They divide to produce secondary permanent tissue that forms the secondary plant body. They are interfascicular cambium & cork cambium. APICAL MERISTEM: It is present at the root and the shoot tip. Consists of pro-meristem & primary meristem. Divide to produce primary permanent tissue that increases the length of the plant. It gives rise to organs like leaves & flowers. During leaf formation and stem elongation, some cells separate, they form the axillary bud. The axillary bud grows into either branch or flower. INTERCALARY MERISTEM: It is present in permanent tissues. A part of the apical meristem separates due to the formation of permanent tissues in between during growth. Divides to produce primary permanent tissue that increases the length of the plant. It is found present below the nodes in mint & above the node in grasses. LATERAL MERISTEM: As it is lateral in position it is referred as lateral meristem. Divides to produce secondary permanent tissue that increases the thickness of the plant. E.g., interfascicular cambium, intrafascicular cambium & cork cambium. Intrafascicular cambium is present in primary plant body but divides to produce secondary permanent tissue. APICAL CELL THEORY was given by Nageli. 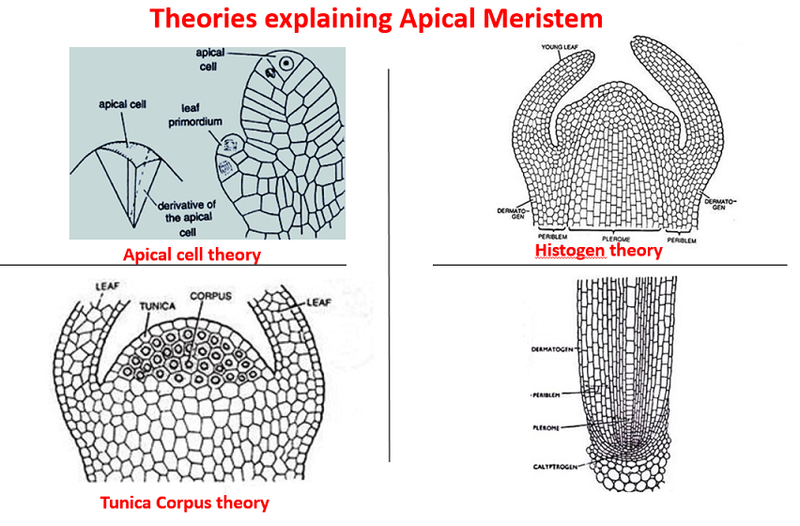 According to this theory, apical meristem has a single apical cell. This is true only in lower plants, i.e., algae, bryophytes & some pteridophytes. HISTOGEN THEORY given by Hanstein. According to this theory, apical meristem has 3 histogens. Outer Dermatogen: that forms epidermis. Middle Periblem: that forms region between epidermis & endodermis. Inner Plerome: that forms region inner to endodermis. Calyptrogen is present at the root tip, the cells of which divide to form root cap. Quiescent center: are a mass of cells present at the root tip in the periblem, that either not dividing or dividing very slowly. Discovered by Clowe in Zea mays. Outer Tunica that forms the epidermis. Inner Corpus that forms the body. PROTODERM: Forms the Epidermal tissue system. PROCAMBIUM: Forms the Vascular tissue system. GROUND MERISTEM: Forms the Fundamental or Ground tissue system. RIB MERISTEM: Cells divide in one plane, forming a row of cells. E.g., formation of lateral roots. PLATE MERISTEM: Cells divide in two planes, forming a plate like structure. E.g., formation of lamina in leaves. MASS MERISTEM: Cells divide in all planes, forming a mass of cells. E.g., formation of cortex, pith, endosperm.